We offer solutions for many different stages of tobacco processing, for example removal of foreign matter, control of humidity to protect aroma, and filtering of valuable tobacco dust for return to production. If you manufacture tobacco-processing machinery or systems, or if you are a cigarette manufacturer, you’ve come to the right place. Aroma is a critical factor for tobacco. To retain it, we offer products that are optimised for each processing stage. In cigarette production, even tiny impurities can spoil the taste and perceived quality of the product. This is why separation of foreign matter is so important. LTG tangential fans are an excellent means of removing foreign particles of different size and composition. They have proved effective in many processing systems where it is necessary to winnow small particles and remove large ones. Their homogeneous air flow is perfect for this purpose. You too can improve your separation process with high-performance LTG fans. 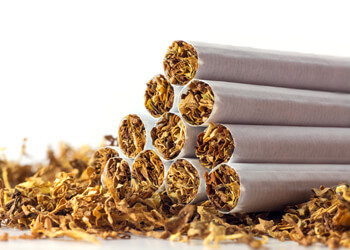 Another important factor in tobacco processing is constant humidity, which ensures that tobacco retains its taste and does not become unappealing by drying up. With LTG humidification solutions you can be sure of having stable humidity. Our humidification systems, especially the high-performance versions with a hygiene certificate, provide perfect control. LTG filter components make it possible to filter, separate and compact the dust generated in tobacco processing and return it to production for further use. Your employees will also be grateful for having clean air in the production facilities. Tobacco processing and storage involve many steps, each of which requires the best possible conditioning, separation and transport. LTG Filtration Technology products have been in successful use for many years now. Our product range has a modular structure, allowing you to adapt all of the components to your application. Our compact filter unit CFU combines the individual products and can consist of different filter stages depending on the design. For example, these systems can be equipped with a TVM pre-filter unit and a fine filter like the CompactDrum Filter®. Reusable filtered materials are conveyed to the respective secondary circuits, where they are efficiently separated by equipment such as our ZSA/ZSB/ZSC centrifugal separators, FKA/FKC fibre compactors or CPS compacting power screws. It is also possible to convey these materials directly to a storage location or return them to the production process. Our HPH humidifiers create ideal conditions for processing or storage. LTG's high-pressure humidification system meets the most exacting demands and has a hygiene certificate. It is equipped with high-performance nozzles with individual filters for maximum efficiency. Our product portfolio also includes fans for air treatment in all designs and sizes. Among those of special importance for tobacco processing are our highly efficient LTG axial fans and high-quality LTG centrifugal fans, which are mainly used for conveying primary air. Our conveying fans in the M./5 RU..MS series were specially developed for conveying recovered materials in the secondary circuits of filter systems. By selecting special, highly wear-resistant material pairings, we have made them very durable and minimised the maintenance requirements. We also offer tangential fans, which distribute air very evenly over large areas. Finally, LTG's product range includes LTG tangential fans, which distribute air very evenly over large areas, permitting efficient and high-quality drying in conveyor systems or throughput processes. They have been successfully incorporated into machinery and systems for winnowing reusable materials. In 1927, when it was still a young company, LTG developed an automatic air treatment system for the Waldorf-Astoria cigarette factory. This was the first such system on the European continent. In the meantime we have gained a huge amount of experience in this field. Our solutions are now in operation throughout the world, helping to produce tobacco goods of the finest quality.